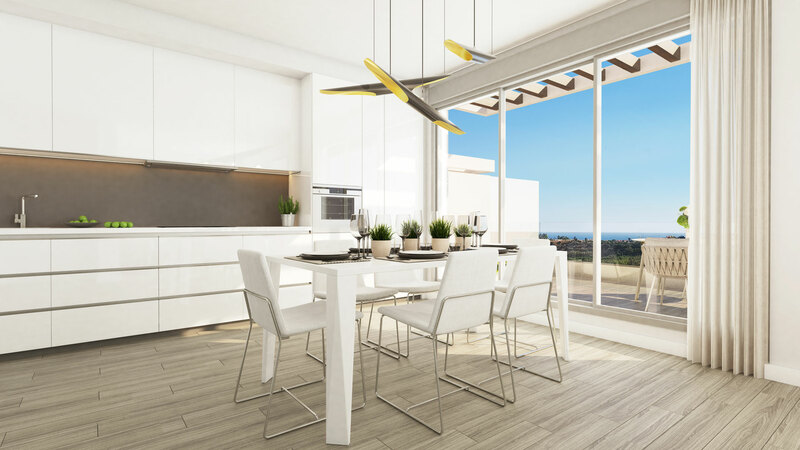 The project sits in an elevated position across five stylish low-rise buildings and benefits from a south-westerly orientation thus making the most of the Mediterranean sunsets. The elegant Town Homes, are located below the sleek apartment buildings, meaning stunning sea views can be enjoyed from practically every property. Conveniently located near the charming village of Cancelada the development offers an abundance of amenities within walking distance and some of the most well-known golf courses including La Quinta, Los Flamingos and El Higueral are within a short drive. Owners will have access to an exclusive Club House boasting fantastic social and wellness facilities such as an indoor pool, sauna and on-site cafeteria. The beaches on this stretch of coastline are also some of the most desirable in the region. There are 36 townhouses within this stylish development most of which enjoy beautiful sea views. These exclusive modern homes are split over two levels and offer an open plan avant-garde design. The open plan living area is spacious with a fully fitted kitchen and elegant lounge and dining area. All of the generously sized bedrooms come with fitted wardrobes and the exquisite master bedroom boasts an en-suite with a walk-in dressing area perfect for modern living. Townhouses of this calibre and in this location are not commonplace. The properties also boast a stunning roof top solarium with breath-taking sea views. A private driveway and generous covered and open terraces help create a personal Mediterranean oasis. The high quality specification includes air conditioning and cool porcelain floor tiles throughout.